This was the best quality field of US stars ever seen at the Aussie GP. 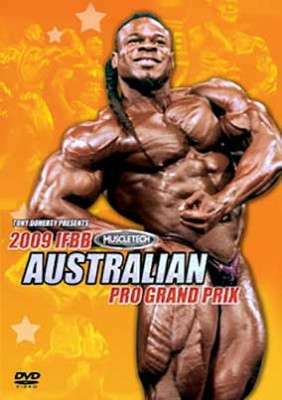 KAI GREENE had won the 2009 Arnold Classic a week before, and SILVIO SAMUEL had just won the 2009 Iron Man Pro a few weeks prior to that. These are two of the hottest physiques in the World having just won the opening 2 Pro Shows of 2009, along with X-Man TONEY FREEMAN. The 3 top amateur men from the NPFC-IFBB All States Amateur Championships who posed were NICK JONES, GRAEME BENNETT and WES NEWELL. This was the best quality field of US stars ever seen at the Aussie GP. KAI GREENE had won the 2009 Arnold Classic a week before, and SILVIO SAMUEL had just won the 2009 Iron Man Pro a few weeks prior to that. These are two of the hottest physiques in the World having just won the opening 2 Pro Shows of 2009, along with X-Man TONEY FREEMAN. What an amazing line-up. Many experts are tipping Kai to win the 2009 Mr. Olympia. He has won his last 3 Pro Shows, and is relatively new on the pro scene.